Do you ever miss the days of leftover pizza for breakfast?! As much as I love a good Paleo pizza, it is my experience that they don’t make great leftovers like traditional pizza. With traditional pizza, it was like the leftovers were almost better than the night before. 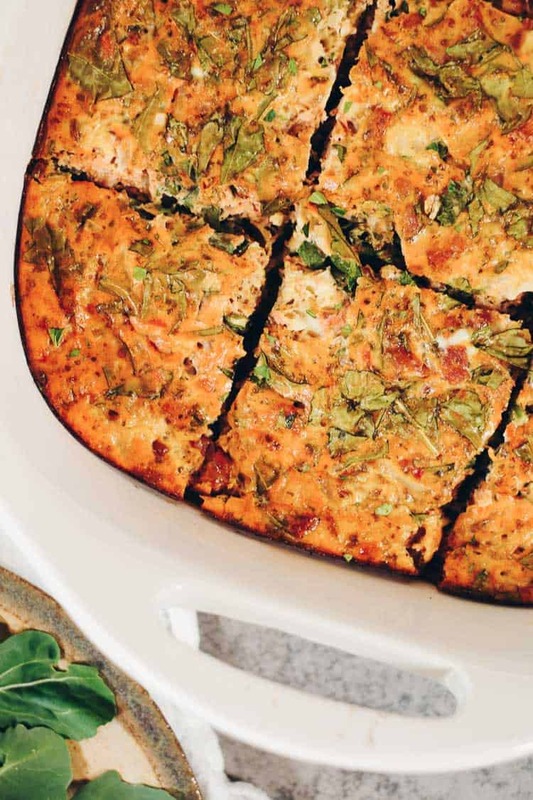 So, to remedy this situation and make life easier, we created a Paleo breakfast pizza casserole. You may already know we are pretty big fans of meal planning and prep (check out our Paleo Meal Plans if you haven’t already). It just makes eating clean so much easier and manageable. One of our favorite meal planning strategies is make ahead breakfast. When you prep a large breakfast over the weekend, all you have to do is reheat the leftovers in the morning during the busy work week. It makes starting your day easy and healthy, which is always good! 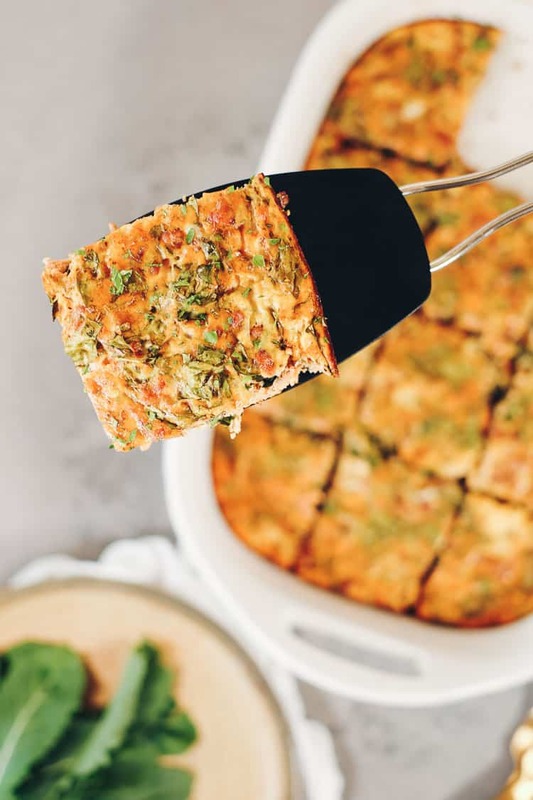 So, with this Paleo breakfast pizza casserole, you really get the best of both worlds – an easy breakfast you can make ahead of time, plus the awesomeness of the pizza flavors! We love simple recipes that require minimal ingredients, yet pack tons of flavors in. 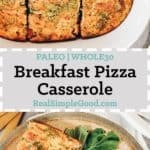 This Paleo breakfast pizza casserole is exactly that! With less than 10 ingredients, it is easy to throw together and also only requires a few easy steps before you put it all in the oven to bake. Go ahead and plan this one for the coming weekend to make in advance for the following week. To make this even more pizza-esque we did add parmesan cheese as an optional ingredient. It is entirely optional though, and we actually make it without cheese most of the time. If you tolerate dairy, then go ahead and add some cheese. If not, don’t even worry about it! 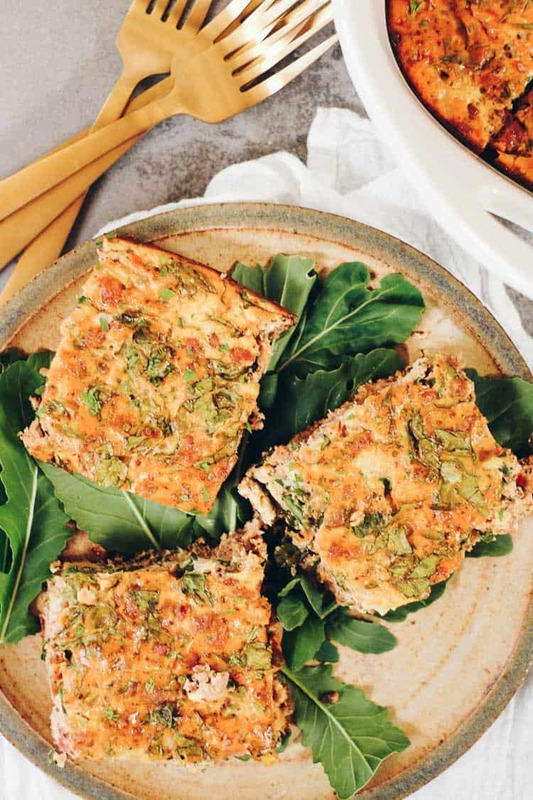 This Paleo breakfast pizza casserole has enough flavor, so you won’t miss it! Plan to make this over the coming weekend, so you have an easy and delicious breakfast on hand the following week. You’ll see how a little meal prep over the weekend can really make eating clean easy and fun during the work week. Let us know how it goes by leaving a comment below. Also, take a photo and tag us on Instagram @realsimplegood, so we can check it out! 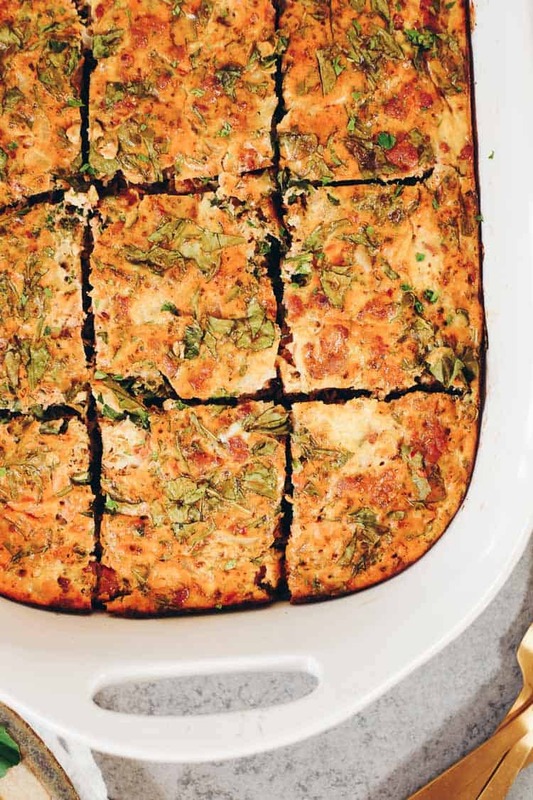 It's like leftover pizza, but healthier and a make ahead breakfast. 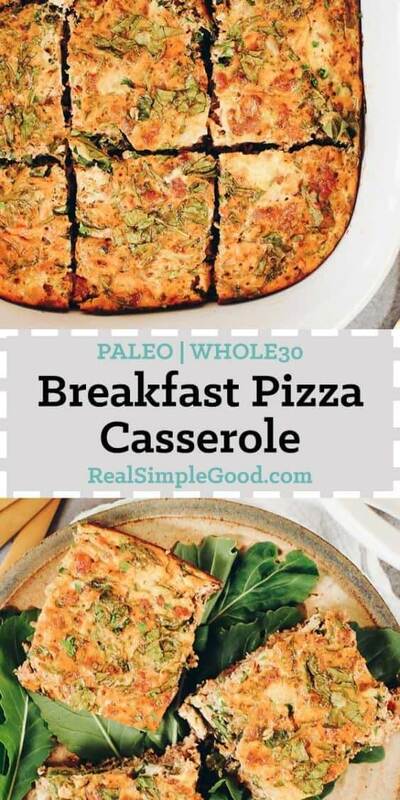 Try our Paleo Breakfast Pizza Casserole for a tasty way to make your work week easier! Chop onion and garlic as noted. Heat a large skillet over medium heat and add in Italian sausage. Break the sausage into small bits and then add in the onion and garlic. Cook, stirring occasionally, until the sausage is browned, about 7-8 minutes. While the sausage is cooking, chop arugula and whisk eggs in a large bowl. Grease a 9x13 baking dish with butter or ghee and preheat oven to 375° Fahrenheit. When the sausage is finished, add it to the bowl with the eggs. Add in arugula, marinara sauce and oregano and mix everything together. Pour egg mixture into the baking dish. Top with cheese (optional). Place in the oven to bake for 30 minutes, or until the eggs are firm throughout. 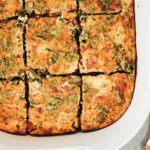 Nutrition facts are an estimate provided for those following a Ketogenic or low-carb diet and include the optional cheese for this recipe. See our full nutrition information disclosure here. I made this for dinner, and really liked it. I used wintercress for the greens, yum. And I love the fact that there is enough for my husband’s breakfast (and mine) tomorrow morning. because I don’t have a 7X11 pan, I made it in a 9 by 13 baking dish, which shortened the baking time. I think you could get 12 servings from it.